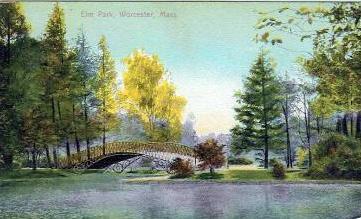 In 1854, Elm Park was purchased by Worcester from Levi Lincoln and John Hammond. It consisted of almost exactly 28 acres. The procurement of the nation's oldest parcel of land set aside for park recreation is attributed to our 4th mayor, John S.C. Knowlton (1853-1854). The following are links about Elm Park you may find interesting. Also check out the other pages. The following are comments left about Elm Park from site visitors such as yourself. They are not spell checked or reviewed for accuracy. Not only the oldest park, but holds the title as being the First Public Park. I used to live on Elm St right across from the park. The ponds were a wonderful place to ice skate in the evenings. Learned to ice skate on Elm Park in the late 40's. In the summertime you could get to the island close to Park Ave. by stepping on rocks in the water. Across Park Ave. was Newton Hill. Great play area for us also. I used to live with my grandmother on Plesant street at the bottom of the hill. My Aunt, who is only a few years older, her and i used to go there and play every night after supper. Around 1949 and 1950 Later in life when my aunts were married their pictures were taken at the park. Looking at these pictures and many of the others bring back so many memories and also refreshens my memory of places i forgot about. Elm park!!! My friends and family took me there as a child in the 70's and I remember one time a friend took me there for an afternoon and we sat under the trees and found TONS of pocket change! What's sad is that Worcester at one time was quite a city - my parents and grandparents had so many stories about so many places that I was never able to see or experience. Some of the places still exist but they're so run down and unloved that you can't even tell they meant anything to anyone. :( I guess I should be happy I had at least Elm Park. In the early 40's we lived on Park Ave. just a few houses down from Elm Park. I tried really hard, but could never learn to stand on ice skates, but a cup of hot chocolate at Andy and Arthur's Spa on the corner of Park Ave. and Highland Street always made it better. I always thought Elm Park was nice and then I saw these pictures! It was much more beautiful in the past. Why can't the City of Worcester get to work on fixing it up. The bridges and the stones that surround the pond really need some work. Elm Park is something to be proud of! Let's make it beautiful again! The Newton Hill section of Elm Park has recently had a great deal of work done by a local group called Friends of Newton Hill. They have done a lot of hard work clearing and marking the trails and removing litter. The area was looking pretty shabby in recent years, but this group of volunteers has made a huge difference. Band concerts were held there for several weeks, July-Aug. in the mid to late 1950's. It was a great way to spend a Sun. evening. I grew up on Dover Street, not far from Elm Park. We spent many days there when I was a child. Playing on the swings, ice skating, and skimming rocks on the water were just a few of the ways we spent time there. 30 second from elm park, across the street, and it is beautiful i spend alot of time there every day, great play ground and i am so amazed at how much great history is behind it!!! My earliest mememories of a park is Elm. My grandmother - Nana - would take me to feed the ducks. My family would have picnics there. My friends and cousins would skip summer school and hang out at the park all day. My first time on ice skates was at Elm. I'll take my family there when I come to visit. Very pleasant memories for me. Oh, yes...how can I forget the stairs! The stairs to Terabithia!! Lots of great childhood/teen memories! I miss Worcester! I loved skaking at Elm park. My family would walk down from Bancroft Tower Road where we lived. We all skated and then had hot chocolate and Devil Dogs across the street in a little place that has been replaced by various supermarkets. This was in the 1950's. It is really a shame that the park is not now as nice as it once was. It is run down, broken benches, broken lights, stone walls around water falling apart. Worcester is not taking very much effort to perserve the landmark or maintain it. SUCH A SHAME!!!!! 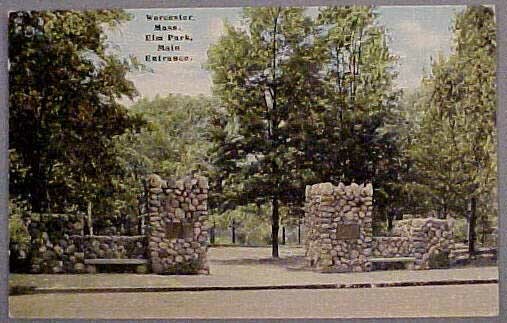 Does anyone have info on that big rock/bolder aside Elm Park and Park Ave. In the 1950's an older Greek man "Mike" was always selling popcorn from an old windowed truck and a few other warm things, his winter parking spot was near that huge rock. I suspect the rock came from a short distance away and probably when Park Avenue was created between Elm Park and Newton Hill (once a problem for the City, being if Park Avenue should cut across Elm Park/Newton Hill). Would be nice if a small I.D. was placed near of on that rock saying it's history. How many wedding pictures have been taking at Elm Park?-What a nice tradition!! 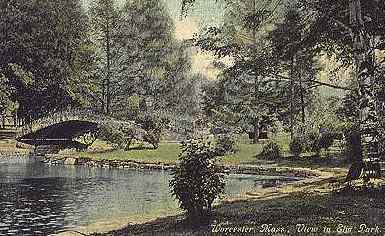 The oldest park in America is Wilkes-Barre's River Common established in 1809. Sorry folks. Elm Park has a million memories for me all good. I realized how beautiful the trees were as a small boy. When my parents moved to Michigan I realized the developers just cut them down. So I ran for Supervisor of Shelby in Michigan and won. I helped save the trees here in my community. Thanks to old Elm Park--I never forgot. 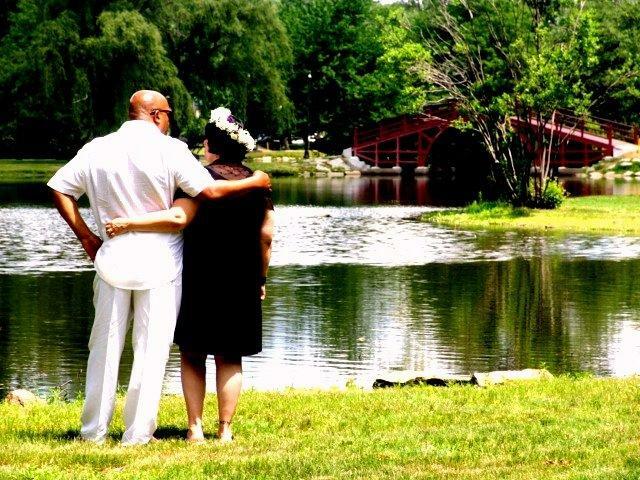 I got married there on a beautiful day in 2008. I have attened numerous events there also. And its nice to just sit and watch the different people. Elm Park will always occupy a special place in my heart. My Grandpa Bonczek was one of the welders for the Bridge in Elm Park. If u go under the bridge, u will see the names of the guys that built it. The blue-prints are in one of the poles....so that in the future...ppl would know what was done. My mom was born 1943, she grew up there....with home, grocery, ice skating, and telephone co....Anyone, know about the telephone co. at the end of the street? I too was one of the many who learned to skate on the pond in Elm Park. 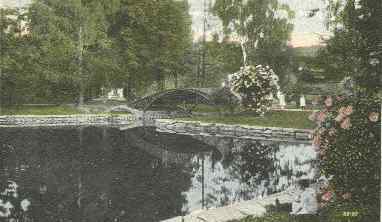 In my later years, I would drive by the park every day on my way to Clark University. Although I now live in CA, I can see the park in its winter glory. It was great to grow up in Worcester. That old Greek man named Mike with the lunch truck was my grandfather. 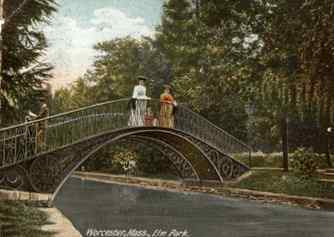 A couple times a week my mother would take us to Elm Park. We played on the swings, walked around, ran around and fed the ducks bread crumbs. Often on Holidays we went to the park to take pictures. Lived around this park from 99-2005,great memories for my family and Albanian-Greek community. 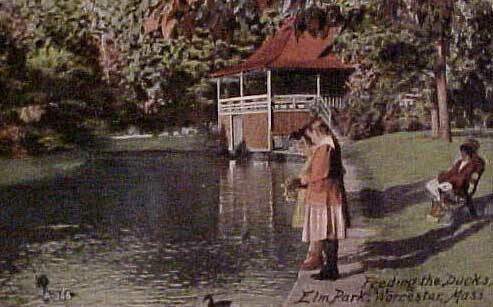 As s kid I would fish the pond while my dad ran laps around the park. 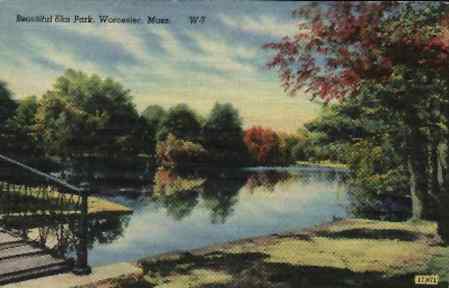 I loved fishing elm park. At one time they had huge foot long red gold fish that were fun to catch. For such as swallow pond it had good size large mouth, pickerel, horn put, etc. Enormous snapping turtles too. 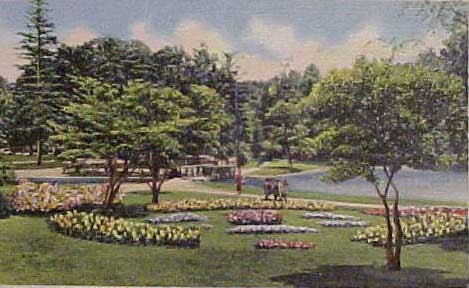 Central Park in Clinton was given to the Town by the Bigelow family in 1852. 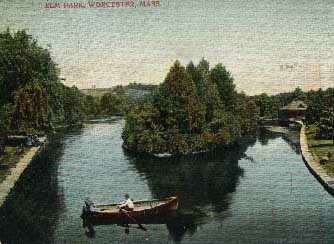 Two years before Elm Park was built. It is still a public park.